It’s true! After what may be a long time burning in flames after dying, faithful Roman Catholics are brought before the throne of God. Can you imagine the horrible shock coming for those Roman Catholics who are waiting for Heaven in the place they believe is Purgatory? They will be brought before the throne of God expecting eternal life, then find out they were actually in Hell all that time and their destiny is really eternity in the Lake of Fire! * The purpose of this page is so that Roman Catholics may be assured of the gift of eternal life. Weren’t the times of flames over yet? Why then are they sent to the ghastly Lake of Fire? Will anyone tell them in Hell where they actually are? If they were told, would they believe it or will they only hope it is Purgatory after all, which it is not. No one will tell them about it in Hell. The only people they will hear are those screaming in pain from the flames while they themselves also are alone in the dark and burning. Why wouldn’t they know it was Hell? Thomas Aquinas, an Italian Dominican friar and a Roman Catholic priest from the 13th century, said that Purgatorial fire is equal in torment to the flames of Hell. They are described similarly. When going there, they might actually realize it is Hell, being told about it during their lifetime. 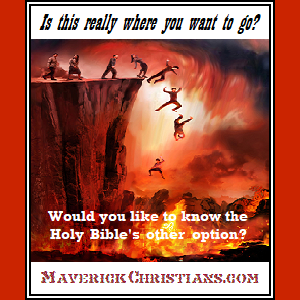 However, the Bible does not talk about people being in Hell being told where they are when they are there. They are alone, in the dark, and burning in flames. The voices they hear are screams. The event of the Rich Man and Lazarus in Luke 16:19-31 happened during Old Testament times when the righteous descended to the non-burning part of Sheol called “Abraham’s Bosom”. The Rich Man spoke to Abraham from Hell across the great gulf fixed in between the two places. In the New Testament age nobody goes to Abraham’s Bosom any more since Jesus the Messiah descended there first before He rose again from the dead. The righteous that were there saw Jesus there then ascended to Heaven with some others also rising again to life on the Earth again. There is no further testimony of such conversations among the unrighteous dead. They will not be able to talk with the righteous that are no longer at Abraham’s Bosom in Sheol. Even if they did have such conversations with others and were told they were in Hell, would they believe it?. They might still hope it would be Purgatory. When judgment day comes and they are brought before the throne of God, then the moment of truth happens when they find out finally for sure in the judgment that they are to be condemned to eternal torment. It has been said by some that Isaiah 5:14 (KJV), where it mentions that “hell hath enlarged herself”, refers to the flames expanding to where “Abraham’s Bosom” was since it is no longer in use for the righteous to go to. All those who place trusting faith solely in God’s Messiah, Jesus of Nazareth, go straight to Heaven when they die. Why Hell instead of Purgatory? The Holy Bible does not teach a place called Purgatory because it says about Jesus Christ that “He Himself purged our sins” in Hebrews 1:3c. 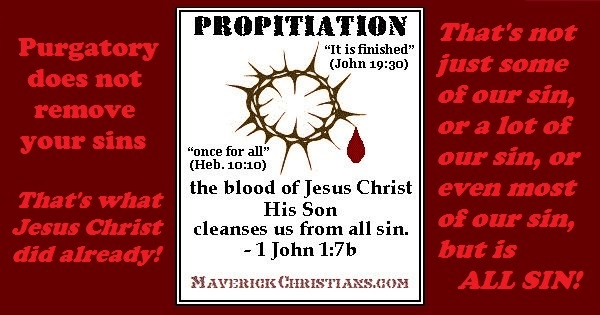 No such temporary place for the purging of sins exists because Jesus did this for us already with His own shed blood. His blood is received by trusting faith solely in Him. Additional faith in others who cannot save will not lead to your salvation. Neither Saint Mary, nor other saints, nor anyone else can save you nor also save you. Believing the gospel of Jesus Christ to save you. The gospel is not about burning in some Purgatory. Those who believe the gospel of Jesus Christ trust Him for the free gift of eternal life and the forgiveness of all their sins. They know their sins are purged already by the person and work of Jesus Christ on the cross. They rightly do not believe they will go to a “Purgatory”. They know that they will go directly to Heaven with everlasting joy when they die. This is followed by them returning with Jesus Christ to the earth at His second coming to reign with Him for a thousand years. Afterwards comes the eternal New Heaven and New Earth. Anyone alive can place their trust solely in God’s Son Jesus to be saved. Do you believe the testimony of Jesus or do you believe another and a different false gospel? Neither the Roman Catholic Church, nor any other church, can save. We are not saved by being faithful Roman Catholics. We are not saved by the Roman Catholic Church nor any denomination. Nor are we saved by doing works, nor by doing penance, nor by being water baptized at any age, nor by confession, nor by participating in the Roman Mass nor any other communion, nor yet by receiving last rites. We are only saved by trusting faith in God solely through His Son Jesus Christ. This is true not only for Roman Catholics but for everyone. Whoever places trusting faith in Jesus Christ will be spared and saved from the flames and will be sent directly to Heaven when they die. They will get judged, but not for condemnation. They will get judged for rewards. Well, that’s our question… “Judgment?” Who misunderstands here? When unbelievers die they DO NOT get brought straight to the throne of God. They burn in Hell first until finally all unbelievers are brought before the “great white throne”. The subsequent eternal torment of the Lake of Fire that follows after Hell is not through a quick judgment. Many unbelievers have been brought to faith in Jesus Christ through Chick Tracts such as this one found in the booklet “This Was Your Life”. Even many Roman Catholics have found out about the deceptions within the Roman church in Chick’s larger comic books such as Alberto. This is not saying that judgment happens immediately. If this is the “second death” then to where was the first death? It was in the grave and in Hell. All of Hades, including Hell, are cast into the Lake of Fire after the final judgment. It is safe to take everything you read outside the Holy Bible with a grain of salt and examine objective facts, especially with the Holy Word of God. 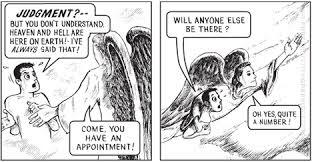 Jack Chick seeks to emphasize the judgment of God without mentioning that the prior Hell, which is not a permanent place but a temporary waiting place comes before the judgment for the unbelieving. The trial of judgment results in them being sent to forever burn in the Lake of Fire. Jack Chick presents a shortened version of the gospel which leaves out something important here. Often, not every detail about salvation gets mentioned when the gospel is shared but it is best to get the full story. Hell is not Purgatory and neither was Abraham’s Bosom. There is no such place as Purgatory. The Roman church comes up with misinterpretations of the Bible about it to attempt to convince people of this myth. This is in order for their Roman Catholic Church to collect incredible amounts of money from faithful Roman Catholics paying for indulgences in hopes of a shortened time in Purgatory. The burning of works that do not produce reward does not presume the burning of those who did them. Historical accounts showing people praying for the dead does not prove that there must be a Purgatory. The only unpardonable sin is to refuse the gospel to eternal life which will result instead to be cast into the Lake of Fire forever. Anyone who does not trust in God solely through His Son Jesus for salvation will end up in Hell then the Lake of Fire, whether they are Roman Catholic or not. However, Roman Catholics may receive the gift of eternal life and go directly to Heaven when they die by placing their complete and entire trusting faith in God’s Son Jesus Christ and in none other. If you choose NOT to believe the message of the Holy Bible and seek simply to convince yourself that you will only get to Heaven through the deeds of Roman Catholicism, at least you now know that when you will be burning you will know where you really are. It will at least spare you the miserable shock that you won’t come to eternal life anytime later. Truly, there will be no hope for you after you die, therefore, place all your trust in God’s Son Jesus Christ to freely forgive you of all your sins today.